Pictures below are from the same dog but different ages. 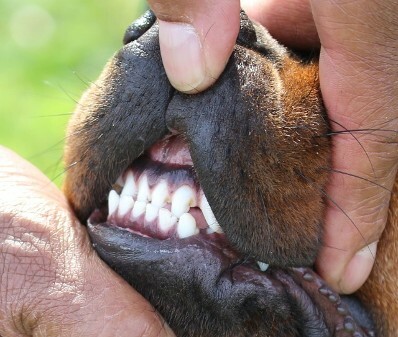 The Rottweiler standard requires the alignment of the teeth in front to be a scissor bite. 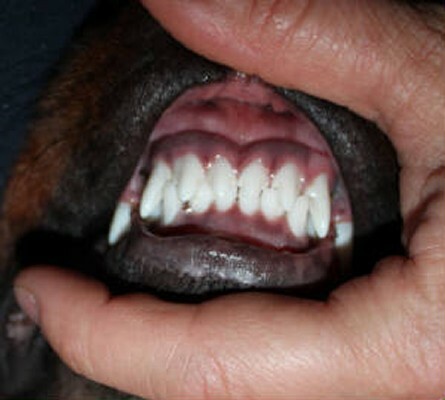 This means the top teeth must lay over the front of the bottom teeth. 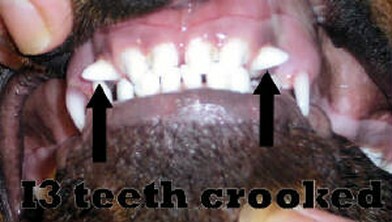 The lower inscissor teeth are slightly behind the upper canine inscissor teeth. 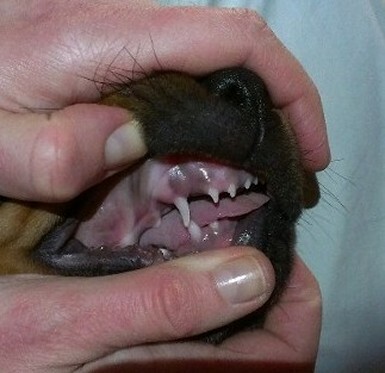 The lower canine is correctly between the first front inscissor tooth and the upper canine. 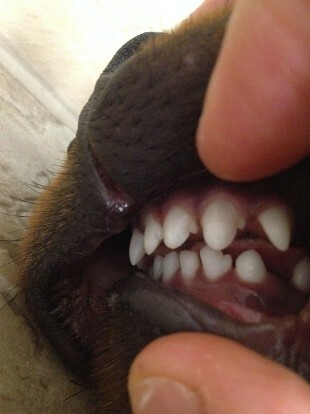 4 month old Rottweiler puppy adult teeth in front now. 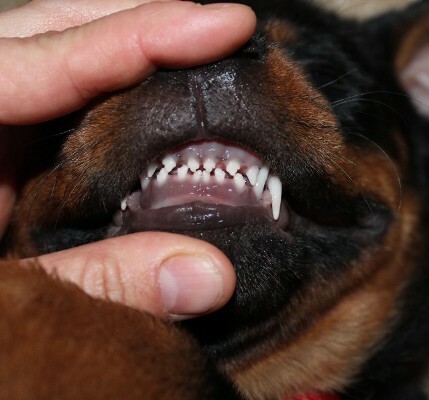 As you can see, puppy teeth are not like the adult Rottweilers teeth. 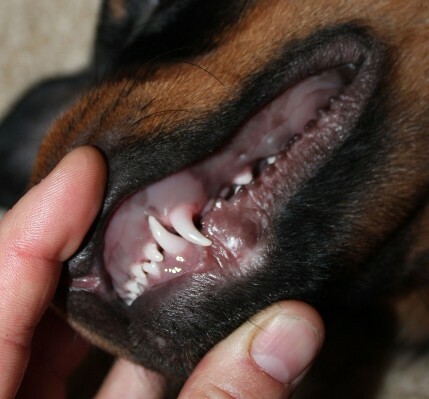 Puppy teeth start falling out about 4 months old. 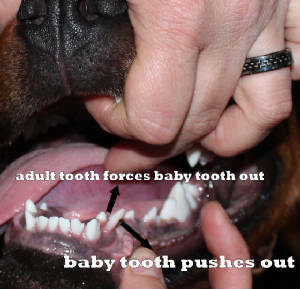 The baby canine tooth is being forced out by the adult tooth. 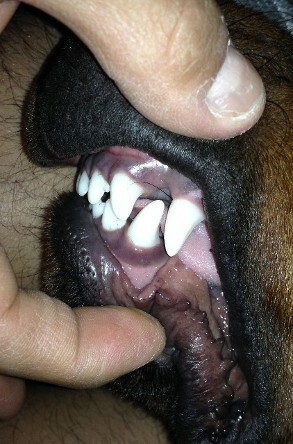 Adult molars are coming out. 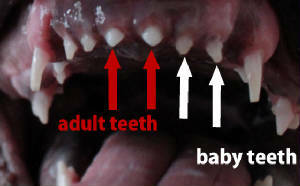 The arrows in red shows the very small adult teeth. 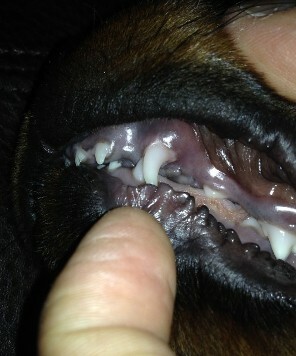 These teeth show around 4 months old. 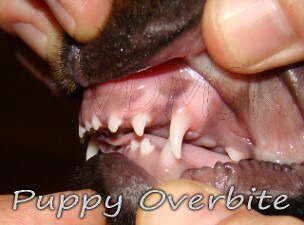 Puppy overbite & underbite incorrect teeth - Pictures submited to use. Pictures below are from dog we do not own. 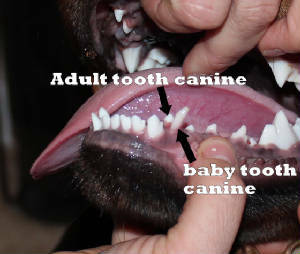 Pictures below is same puppy, we are watching the jaw and teeth change from 8 weeks to 4 months old. 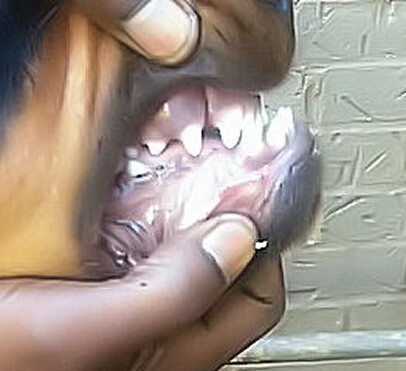 The puppy's bite is incorrect and may cause problems. This is not one of our puppies or from our bloodlines. This puppy is owned by someone in Florida. 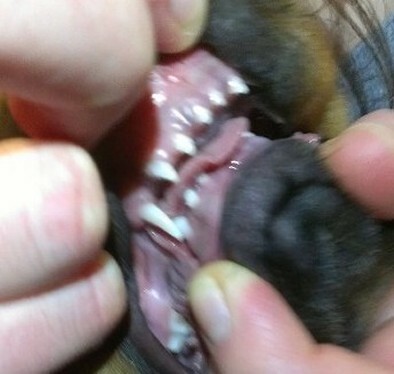 The owner in Florida was told by the breeder this puppy's bite would correct in time. This puppy was also sold as a pet for $4500.00 REDICULOUS! Greed! The owner is taking pictures for us to show the progress. 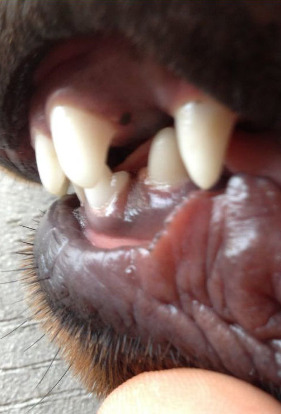 If you notice in the first picture ( May 1, 2014 ) the canine teeth are in line with each other. 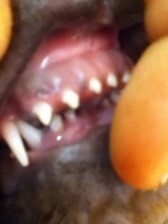 Also the lower canine was growing into the roof of the poor puppies mouth!!! This hurts!!!! 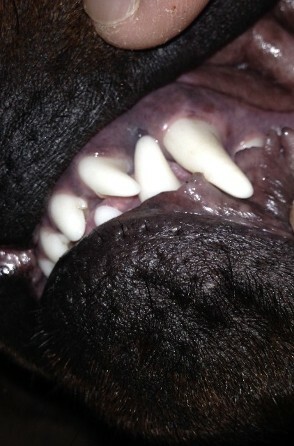 Notice the large gap between the front teeth. 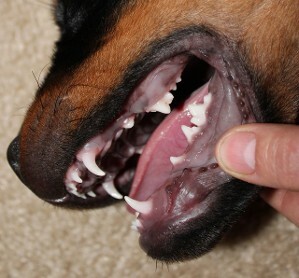 The second picture ( June 5, 2014 ) shows the lower jaw may of grown out a little. 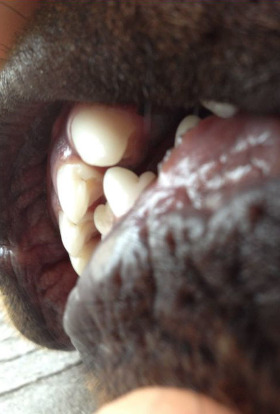 This is good because if the canine teeth doesn't have space then the teeth with either hit each other or grow at angles, even possible causing the mouth not to shut. 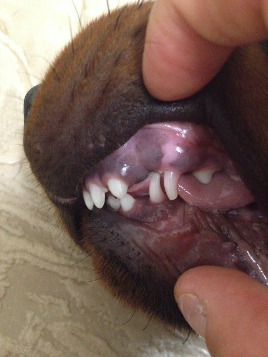 The third picture ( July 6, 2014 ) of the lower jaw, BUT..... now the front "I" teeth are touching and still have lots more growth. 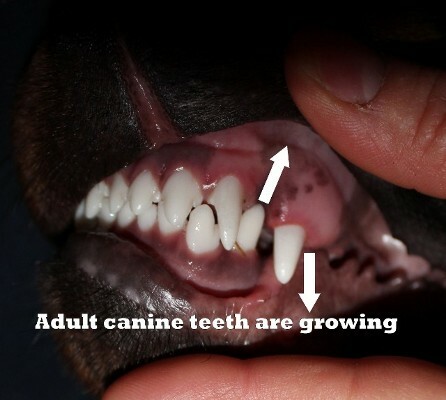 Also if you notice the upper canine adult teeth are barely starting to poke out, and they are coming out in front on the baby canine teeth! This is another problem starting. 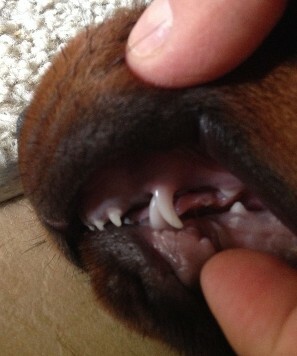 We are just over 5 months old and all the adult teeth have come out. 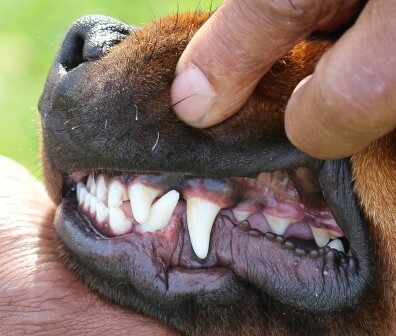 In the first and secoond picture you see the front teeth are still not close enough to being a correct bite for showing your dog, but it is better than how the teeth started and wont cause a problem. 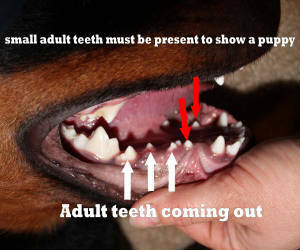 The third picture is the lower canine, it may cause a problem because it really needed to come out more twords the front of the jaw or the top canine needed to come out tword the back of the jaw so they would innerlock when closed. 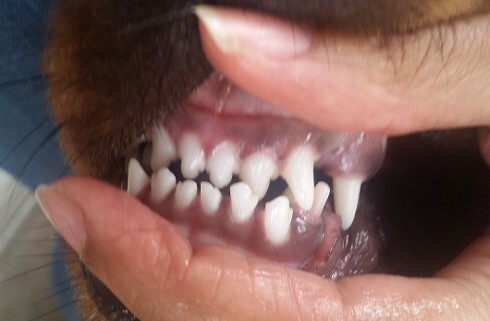 These teeth may hit when they come out more. More pictures soon to finish how the bite looks. 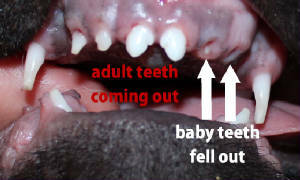 At 9 months old (Novemer 15, 2014) and all the adult teeth have come out, this will be probably the best final outcome. it may have a little more change but if the owner has change he will email me some new pictures.